Around lunchtime on Sunday, Sergei Yurchenko, a pro-Russia militia leader in the region of Crimea, got a call on his cell phone from an officer of the SBU secret police, Ukraine’s successor to the Soviet-era KGB. He knew many of its agents well. Hardly a year has passed since they investigated him on charges of separatism, reports time.com. Since the early 2000s, when he first began training pro-Russia paramilitaries in Crimea, the Ukrainian agents would often subject him to interrogations about his political views, and they would supervise police raids on his training camps in Crimea to search for weapons and ammunition. Now, those same agents are essentially working for him. "Hey, Kolya,” Yurchenko said into the phone, using a nickname for the agent, as he drove through the streets of the Crimean city of Bakhchysarai in his SUV. "What’s the good word?” The agent on the other end of the phone asked him to come to a local polling station, where the residents were voting in a referendum on Sunday to allow Russia to annex Crimea. Later in the day the referendum passed overwhelmingly, setting the stage for further confrontation between Russia and Ukraine and its Western allies. The dissenting voices of Crimea’s ethnic minorities, primarily Ukrainians and Muslim Tatars, have meanwhile not been counted in the referendum, because they have largely boycotted the vote as an illegal act of separatism. "We’ve lived under totalitarians and idiots on this land,” says Akhtem Chiygoz, the leader of the Tatar community in the city of Bakhchisarai, where Tatars make up about a quarter of the population. "But in Ukraine at least we’ve felt free. The struggle for our rights has been open and declarative in Ukraine. Now we will have to continue that struggle under an occupation.” On the day of the referendum, Chiygoz was holed up in his office with a few of his fellow Tatar activists, smoking cigarillos and watching the results come in on the local Tatar television network. If Yurchenko was the winner of the day, Chiygoz was the loser. Those pockets of dejection were isolated, however, and they were drowned out by the celebrations put on for the ethnic Russians of Crimea. Pop stars flew in from Moscow to serenade the locals from a stage set up in the capital, Simferopol, where columns of cars waving the Russian tricolor drove through the streets honking their horns in jubilation as the results of the ballot came in. "And now I’ll be returning home, at once a saint and a sinner, where the vodka will soothe my ailing voice,” sang the Russian diva Vika Tsyganova, dressed in a gown of bright red silk. Days after coming to power last month, the parliament in Kiev passed a bill revoking the rights of Ukraine’s regions from making Russian an official language alongside Ukrainian. 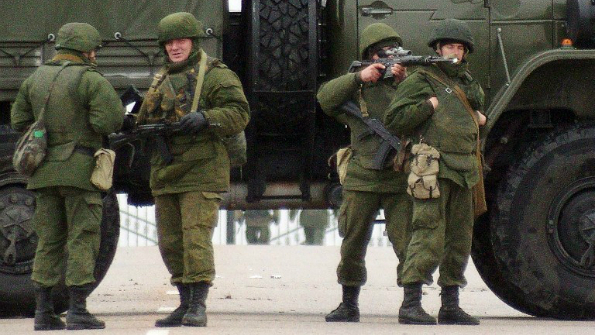 For ethnic Russians in Crimea, that felt like an omen of worse persecution to come. "If they hadn’t done that, if they had come to us offering greater autonomy from the beginning, offering respect for the Russians of Crimea, things would not have come to this,” Yurchenko says. And even though Kiev did not take long to realize its mistake — repealing the discriminatory language law and offering greater autonomy to Crimea this month — it was too late. Russian troops had by then occupied the region. The SBU security service and the regional police force in Crimea had switched sides, pledging allegiance to the peninsula’s new pro-Russian leader, Sergei Aksyonov, who had come to power with the support of armed commandos on Feb. 27. "We are going home!” Aksyonov said from the stage in Simferopol on Sunday night, a few hours after the referendum ended just as he had intended. "Crimea is part of Russia, comrades, hurrah!” And with that, the Russian national anthem began to play over the sea of Russian and Crimean flags. "No one can take our victory away,” Aksyonov shouted into the microphone, and the crowd began to roar in jubilation.